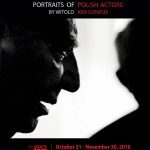 Krzysztof Zanussi, internationally-acclaimed Polish film director, scriptwriter and producer is a recipient of a prestigious 2016 WINGS AWARD from the Polish Film Festival in America given for his achievements in the art of film beyond Poland. Born in 1939 in Warsaw. Film, theatre and opera director, screenwriter, producer and author. Recognized as a creator of intellectual and philosophical films. He studied philosophy at Jagiellonian University in Cracow and physics at Warsaw University, before graduating from the National Film School in Łódź in 1966. Recipient of many awards, including the David di Donatello Prizeof the Accademia del Cinema Italiano, the Cavalier’s Cross of the Polonia Restituta Order, and the Cavalier de L’Ordre des Sciences et Lettres. Member of the Papal Academy of Fine Arts and Literature. He is a professor of European film at the European Graduate School in Saas-Fee, Switzerland, also a professor at the Silesian University in Katowice. President of TOR Film Studio. Member of the European Film Academy, from 2011 (member of the board). Mr. Zanussi resides with his wife Elzbieta in Piaski near Warsaw.